The time has come round again to elect our new School Council. The present School Council have worked really hard and have thoroughly enjoyed their roles. They have shown great commitment to their positions and dedication to our school. The School Council is a group of children elected by their classmates who represent their views and make a positive contribution towards school life. The representatives meet regularly to discuss issues about school and any matters their class would like to raise. They plan and carry out fundraising activities and events, such as holding events, helping organise and run our ‘Summer Spectacular’ to raise money which is then spent on further improving our school. What qualities does a School Council Representative need? 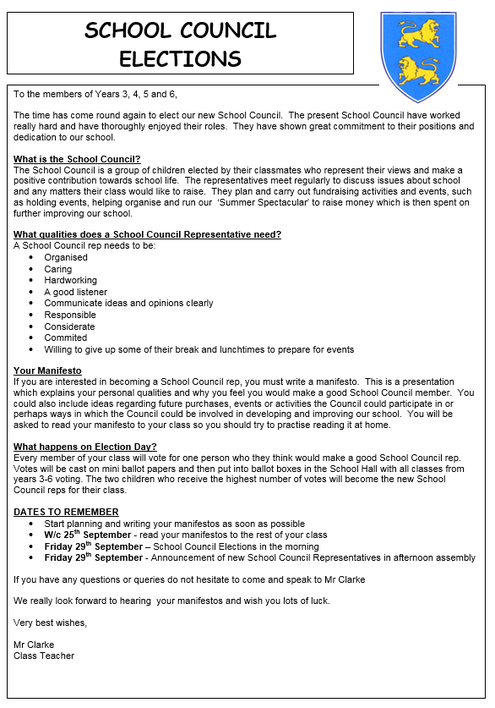 If you are interested in becoming a School Council rep, you must write a manifesto. This is a presentation which explains your personal qualities and why you feel you would make a good School Council member. You could also include ideas regarding future purchases, events or activities the Council could participate in or perhaps ways in which the Council could be involved in developing and improving our school. You will be asked to read your manifesto to your class so you should try to practise reading it at home. Every member of your class will vote for one person who they think would make a good School Council rep. Votes will be cast on mini ballot papers and then put into ballot boxes in the School Hall with all classes from years 3-6 voting. The two children who receive the highest number of votes will become the new School Council reps for their class. We really look forward to hearing your manifestos and wish you lots of luck.